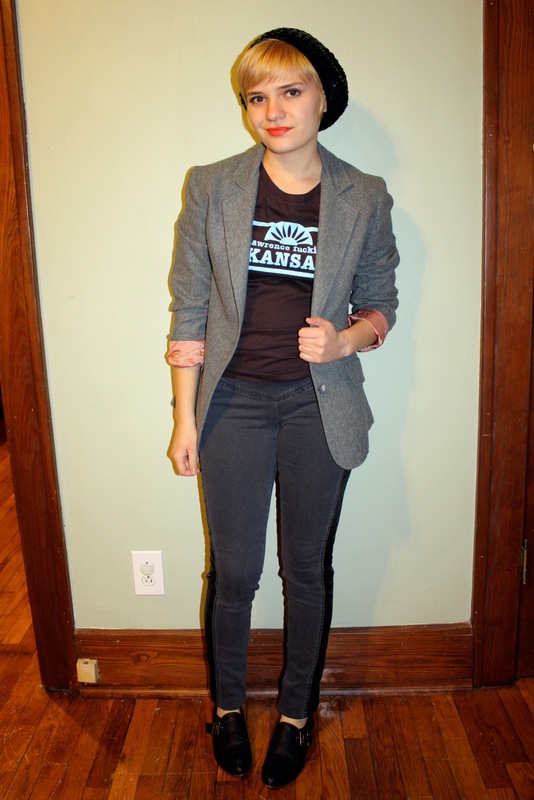 I love showing my Kansas pride, and what better way than with one of LOLA artist Leslie Kay's beloved tees. Since the shirt has some attitude, I went with an edgy look featuring Jessica Simpson tuxedo jeans, cool buckle flats from Wanted and a snazzy sequin beret. This is the last of my LOLA posts, and you know what that means: the sale starts tomorrow! If you live in the area, head over to Van Go between 12 and 7 on Saturday or between 12 and 5 on Sunday. Support independent artists and shop local this Christmas! The beret is the perfect finishing touch to the simple, boyish charm of this look. Great as always. Love this look! It's one of my favorites that I see on people. Kind of a dumb question, though-does your hat stay on your head, easily? I have purchased one blazer but have yet to find just the way I want to wear it. This picture would definitely be my goal. I'm really loving your blazer! I've been on the hunt for an affordable one for a while now (I found a great one at J.Crew. . . but not for $200!) Anyways, I like how you kept it casual with the beret. . . a nice touch!